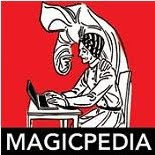 A few months later I would see the poster on display at the American Museum of Magic. And over the years I would see various versions of the poster, but getting one myself always alluded me. in May 1977. It was one of their most popular posters. It was called 'The Bird of Paradise or The Phoenix'. 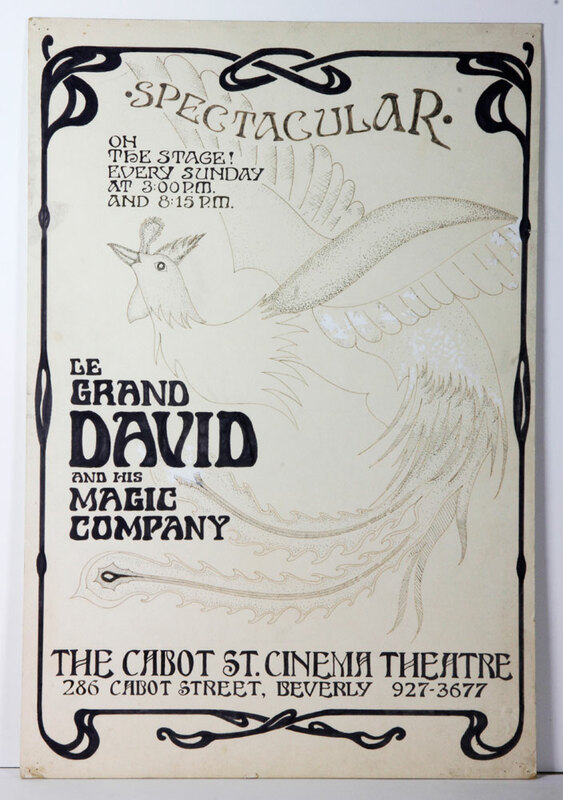 The poster featured the full name of the theatre for the first time, The Cabot St. Cinema Theatre, and also proclaimed the newly added second show on Sundays at 8:15pm. The design was done by Rick Heath, it was marker on mat board. What made the poster so unique is that on some of the posters, members of the company customized them by adding paints, water colors, glitter and even decoupage. 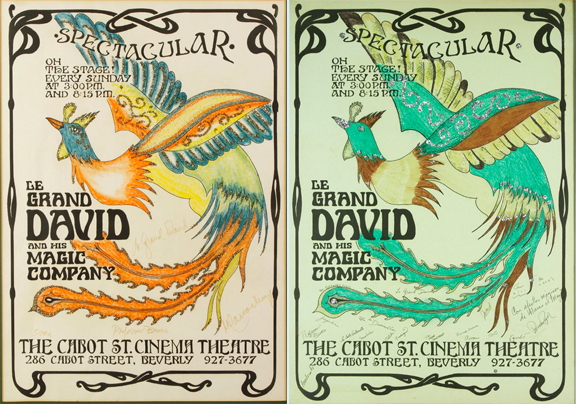 The posters were printed on various colored paper and came in two sizes 20.5x28.5 and 10x14. I have only ever seen the larger ones customized. The two images above are from the first Kaminski Auction. I have seen various other versions on ebay and elsewhere. 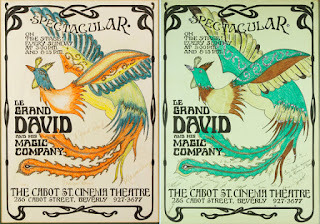 Finally, thanks to the kindness and generosity of one of my readers, I can proudly say I have one of the customized Le Grand David Phoenix Posters in my collection. I have never seen a blue version before so this one is very special to me! 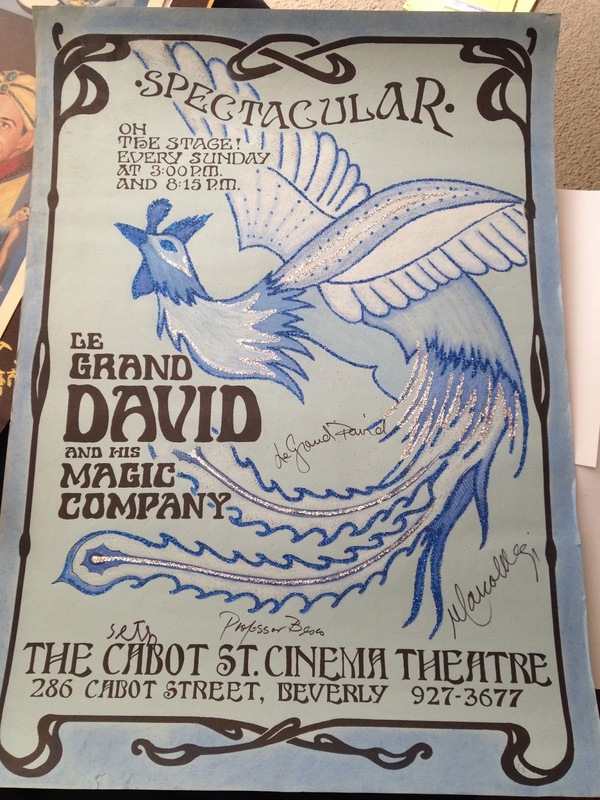 The poster is also signed by Marco, Seth, Le Grand David and Professor Besco, the four lead performers at that time. what a prize! You deserve it Dean- so glad it's in your possession now. What a great piece of art and history. I have the orange one above also signed by the members and framed. Any idea on what these are worth? Would be interested to know. This was a wonderful show all done by wonderful people. I don't know the value for certain, but they seem to have MORE value than some of the other posters because they were hand done and they're signed. 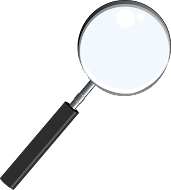 I've seen them go for hundred dollars and more.